The territory known as Mugello is an area in northern Tuscany, a few kilometers north of Florence. The area of Mugello is a wide, green valley crossed in parts by the Sieve river, one of the major rivers that flow into the Arno river, Tuscany's principal river. 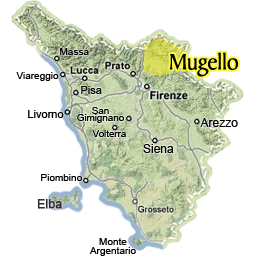 The Mugello is marked off in the north by the Tuscan-Emilia Romagna Apennines, in the south by the Monte Giovi peak and by Monte Senario and Monte Calvano in the west. The house of Giotto, small and well restored, in the countryside of Mugello provides an excellent opportunity to appreciate the many scenic views of the mountains in North Tuscany. The well maintained garden provides a beautiful spot for a picnic or inspiring views for artists. On the 8th of September, the small town of Scarperia celebrates its founding by the Florentine Republic by recreating the passage of power between the outgoing and new vicar. The town's “rioni” compete in Renaissance games for the Palio del Diotto. The Park of Pratolino was the largest villa with gardens of the Medici family, with water grottoes, statues and other wonderful things. Today, even if radically different, the park is open to the public and is an ideal destination for a day out of Florence. North of Florence, in only 25 minutes, you will come upon Lake Bilancino in the Mugello area. Loaded with fun outdoor activities, choose between the beaches, biking, hiking, SUP and sailing. Read here for some itinerary ideas. Just north of Florence, the Mugello valley makes an ideal place to stay for an adventure in Tuscany. The natural, virtually uncontaminated, beauty beckons nature lovers, but there is so much more than what meets the eye...we got the scoop!